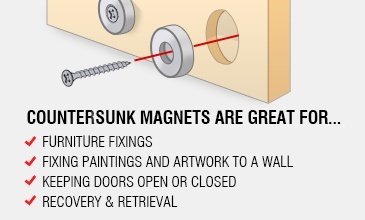 Magnets with a countersunk hole are ideal for furniture fixings, securing artwork to the wall, and door catches. 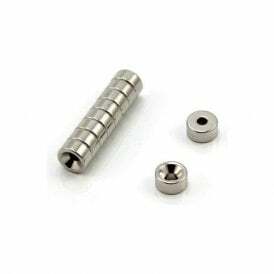 Their design allows users to screw them in place easily, providing you with a magnetic point to attract to or repel from in no time at all, with either pole available on the magnetic face. 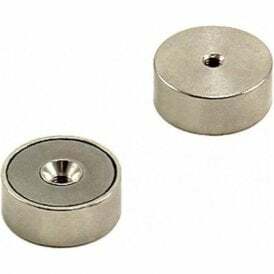 Cabinet making - Typically you’ll find countersunk magnets used as invisible closing mechanisms and soft drawer closures. DIY - Neodymium magnets can be used to create gate latches, holding doors open and closed, fixing bath panels and creating removable access panels. Shop fitting – Magnets are often used in shelving and lighting systems, screens, window displays and signage.